SPECKTRON, manufacturer and supplier of pioneering Audiovisual (AV) and ICT products andsolutionswill unveil its all-new VWF Video Wall series at Gitex Technology Week from 16-20 October at the World Trade Centre,Dubai. Buyers from retail and commercial environments at Gitex will notice standoutfeatures of the SPECKTRON VWF Video Wall like industry-leading 1.8 mm dual bezel, 24x7 operation, and superior IPS panel with high image quality. The super narrow bezel eliminates interference to the utmost degree, leaving audiences to focus on rich visual content rather than on the display itself. It also maximizes display area for a near-seamless and immersive viewing experience. Large scale video displays require content to look great from any angle. The SPECKTRON VWF series video walls boast 178 degree horizontal and vertical angle, which keeps consistent color representation and contrast at any angle. High quality IPS panels combined with the 1920 x 1080 resolution ensure display is consistent with accurate color from all viewing angles. 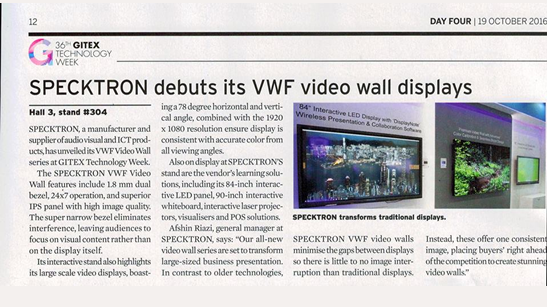 The SPECKTRON VWF series video walls are available in 47”, 49” and 55”. Also on display would be SPECKTRON’s flagship interactive learning solutions – 84” Interactive LED Panel, 90” Interactive Whiteboard, Interactive Laser Projectors, Visualizers and Point of Sales solutions.